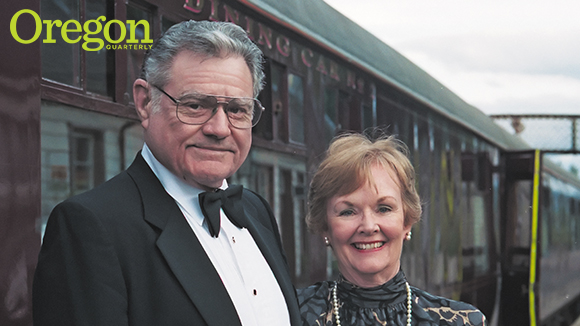 Tom and Carol Williams gave a modest donation during the 1980s that was meant to cover small but urgent needs—such as a sewing machine for award-winning costume designer Alexandra Bonds. Gratified by the difference their first gift was making, the Williams gave again in 1995—$1 million that qualified for state matching funds—for grants allowing faculty members to test innovative course ideas. “We believe it’s vital to engage undergraduate students, says Tom, who developed a theory that private funding can quickly leverage good ideas during his year as a White House Fellow under President Lyndon Johnson. Twenty years later, the Tom and Carol Williams Fund for Undergraduate Education has incubated 88 projects and awarded 30 Williams Fellowships to the university’s most exceptional teachers. Many projects have become regular course offerings, and some have evolved into certificate programs. Without the Williams’ gift, most would have died in the daydream stage. “The Williamses inspire the council about great teaching,” says Karen Ford, an English professor and senior associate dean for the humanities. In a few cases, multi-year grants have resulted in major changes (revising the honors college’s focus from Western civilization to world history, for example). Most support topical ideas for immersing students in the life of the mind—a course about the feast in medieval history allows students to time travel through food; a class introducing mediation from a legal perspective; or varied creative approaches aimed at getting students to go beyond facts by revealing how scholars discover and examine them. He and Carol share great satisfaction in seeing people try things that “aren’t frozen in the past.” Three outstanding examples include the Inside Out Program, where honors college students go behind prison walls to study with incarcerated men and women; the journalism school’s “Science and Memory” reporting initiative on climate change; and DesignBILD, in which architecture students find clients, design projects, get permits, and build them. “We want to institutionalize the council so that award recipients will continue to be chosen by a group of outstanding faculty members who are recognized for excellence as teachers,” Tom says. He met Carol Belknap (as in the hot springs east of Springfield) at their alma mater, Stanford University. They settled in Eugene, where Tom was president and chief executive officer of the Eugene bakery founded by his grandfather in 1902. “He moved it to the 13th Avenue site in 1908, specifically so that Tom’s dad, aunt, and uncle could get a good education,” Carol notes. Carol was a cofounder of Eugene’s NBC affiliate, KMTR-TV, and a mainstay of many civic groups. Tom served on the airport commission, the YMCA board, and the Eugene City Council. In 1991, they sold Williams’ Bakery to Portland-based Franz Family Bakeries and retired. The aroma of fresh bread, savored by generations of UO students, continued to waft across campus until 2006, when the university purchased the factory site to make way for Matthew Knight Arena. See a list of proposals made possible by the Williams Fund at: https://provost.uoregon.edu/williams-fund.